Much of the original artwork for the vintage Kenner toys was "patterned" from hard woods such as cherry or mahagony. Ideal for non-organic shapes, such as the hard lines and mechanical details of droids, weapons and vehicles, this process was equivalent to the sculpting done in wax and acetate for most of the figures in the 33/4", 12" and Micro Collection lines. Carved in several different pieces, both by machine and by hand, such patterns also incorporated numerous outside details, which might themselves be carved from another material or hand-cast from a rubber mold. 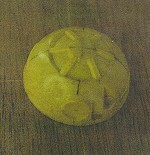 Such patterns were often created at twice their intended production scale in order to allow for a greater degree of detail in the final production molds. Unfortunately, the intricate details of most patterns were destroyed during the creation of production tooling, having been torn off or distorted during the taking of negative epoxy casts, which would then be used in the final pantographing process to create the production molds. 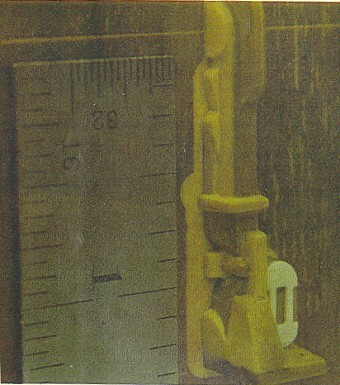 R2-D2 was probably one of the few of Kenner's Star Wars action figures to be patterned in wood rather than sculpted. 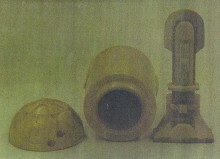 The simplistic shape of the droid was well-suited to this technique. Here you see a close-up of the "head." Here's a second shot of the primary pieces. I apologize for the dim quality of the photos, but you should still be able to make out the parts in this shot. This shot of the leg beside a ruler should give you some idea of the scale at which this pattern was created--it appears to have been made in the scale at which it was intended to be produced. Only one half of the leg is visible here. Many of these patterns appear to have been made in halves. Since the production molds would themselves be made in separate halves, this probably facillitated the translation of these 3-dimensional models into negative casts, and finally into steel. These incredible photos were uncovered thanks to the diligence of an anonymous collector, who's done us all a service by bringing these to light.